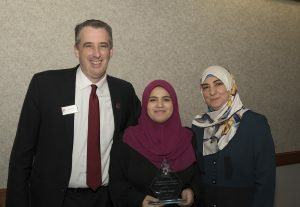 Director of Admissions Peter Rice with School Counselor of the Year Nada Sabo, center, and her supervisor Khaldiya Mustafa. MAHWAH, N.J. – The Office of Admissions at Ramapo College of New Jersey recently named the recipient of the Nancy Jaeger Award for Excellence in Counseling at the annual College Counselor Luncheon held on its Mahwah campus. Nada Samo, a school counselor at Al-Ghazaly Jr./Sr. High School, a private school in Wayne, New Jersey, was chosen for the 2018 award. She was selected from dozens of counselors who have “gone above and beyond to continually connect great students with Ramapo College,” said Director of Admissions Peter Rice. “We are delighted to award the Nancy Jaeger Award for Excellence in Counseling to Nada. Ramapo greatly values both our long term and newly strengthened partnerships with school counselors. 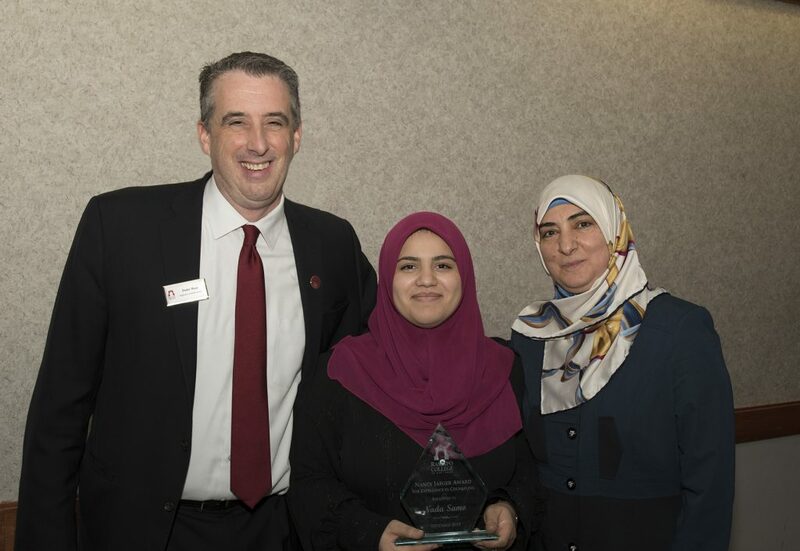 Nada and her supervisor Khaldiya Mustafa are supporters of Ramapo and we are proud to recognize Nada with this award,” Rice said. Ms. Sabo joined Al-Ghazaly Jr./Sr. High School in 2013. She also has been a domestic violence advocate for more than 10 years and participated in the founding of Wafaa org, an organization that provides many services to hundreds of low-income families in New Jersey. This is the fifth year Ramapo has bestowed the award, which was named for the College’s former Director of Admissions, who fostered close relationships with guidance counselors across the state over her nearly 40-year career at Ramapo College. More than 115 counselors from high schools in New Jersey, New York and surrounding states joined Ramapo College students and staff from student-based offices for the event.